It is built on Land Rover's new Premium Transverse Architecture, resulting in more interior space while ensuring that it will be better set to carry the latest engine technology. That will include a 48-volt mild hybrid system from launch, which uses a belt-integrated starter generator and underfloor battery. At speeds below 17km/h, the engine can shut off before the car comes to a complete stop, thus helping to reduce fuel consumption. Energy recovered during this process can then help to decrease the load on the engine during acceleration, further improving fuel consumption. There are plans to introduce a plug-in hybrid model in 2020, which will have the capability of driving short distances using only electric power from a larger onboard battery. 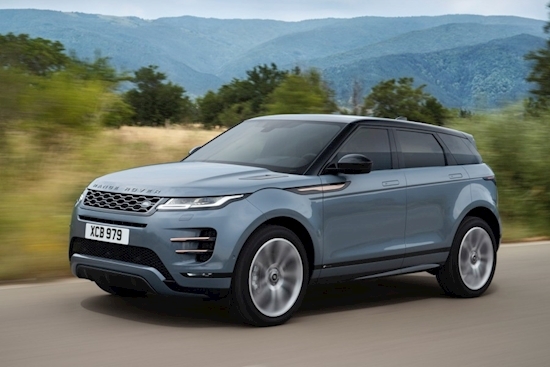 As part of the new design, the Evoque takes styling cues from the larger Range Rover Velar, including flush door handles and sleek Matrix LED headlights. Higher-spec R-Dynamic models also get burnished copper accents to differentiate it further. Inside, there are alternative material options to leather, including a Dinamica suedecloth and Kvadrat wool blend. A twin-touchscreen layout for the dashboard adds to the modern look in the cabin. The new Evoque remains a Land Rover when it comes to tackling more challenging terrain, with wading depth increasing to 600mm. It will also debut a new Ground View feature that has the effect of letting drivers see through the bonnet to what's underneath the car thanks to some clever camera software trickery. All models will also get a reversing camera as standard. To give potential customers in Ireland a first look at the Evoque, Land Rover will be hosting preview events across its dealer network between March and May.